It's Wednesday and another crisp fall day here in Spokane. I keep hearing about heat waves around the country, but it's certainly not here. Our temperatures have been lower than average for weeks and most of the leaves have fallen already around our neighborhood. We bought a new mattress a few months ago and the queen size quilt I had made no longer fit it because the new mattresses are so deep. A friend at church made this quilt for us, actually her Mom had 80+ tops pieced when she passed away. Eva-Mae made the tops and then her daughter, Nancy would bind and hand quilt them. Nancy added some fabric to make the border deeper and then hand-quilted this beautiful blanket for us. I need to get some new pillow covers to match but isn't it nice? I love it. I'll take the one I made out to the trailer for our queen size bed there. Do you see the painting of the Arc de Triomphe in the top left corner? Dennis and I watched the artist paint this while we were in Paris a few years ago. We bought it for the equivalent of about $10! It cost a LOT more than that to frame it when we got home because it wasn't in U.S. measurements. I love it though. Lots of good memories. 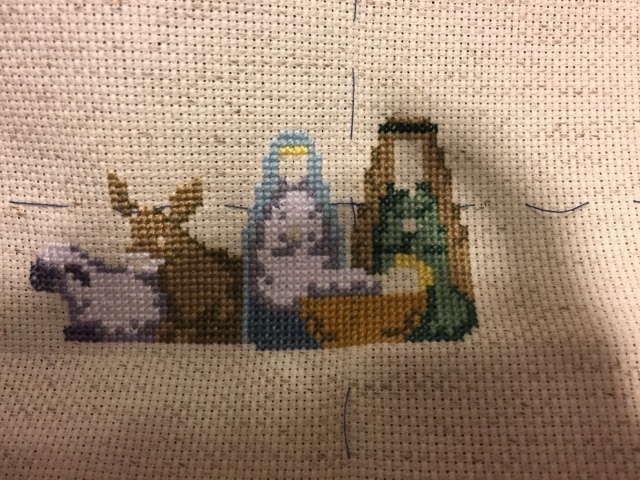 This is my progress so far on the cross stitch SAL I'm doing with Vicki, (Stitchy McFloss). Isn't it cute? Feel free to join in. The pattern is free on Vicki's blog and we'd love to have company in this stitching fun! I also made three "Knitted Knockers" for a local oncology unit. If you've never heard of them, they are given to women who are being treated for breast cancer and are much, much more comfortable than the silicone ones you get from the medical profession. I have had two friend use ones I've made for them and they are so appreciative. They are so soft on the scar tissue. If you don't have a local place to donate them, there is a national group that collects them, stuffs them and mails them to women who would like them. You can find them as a group on Ravelry or just google Knitted Knockers and you'll find the free pattern and all of the information you need regarding appropriate yarns, etc. Everyone can make a difference even if you don't knit or crochet. It's a non-profit group that also accepts donations to pay for stuffing materials and postage. 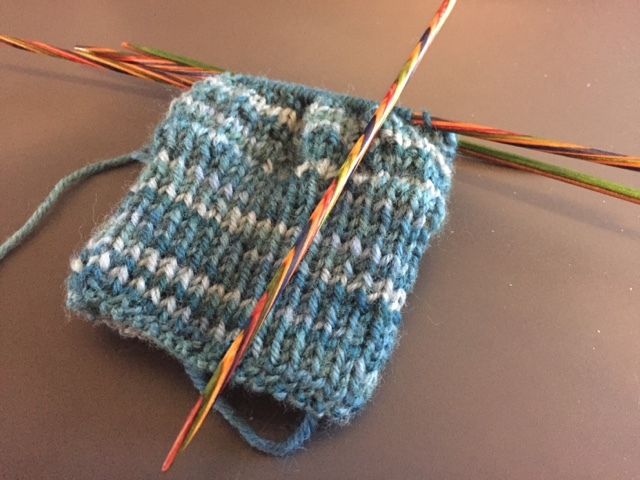 I started a new pair of socks too! I always seem to have several projects going at once don't I? Another sock yarn leftover square in in process. 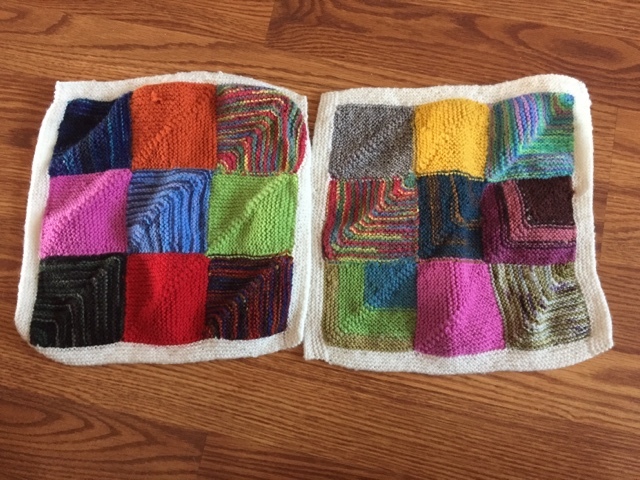 And two squares are done. I think I'm going to like this blanket. Friday morning we're heading to Oregon and the coast. I'm excited to see all of the girls and Dennis is looking forward to visiting with Teresa's husband Dayle. They really hit it off when they met last time. I hope there is some sunshine while we're there so we can do some beach walking, but the forecast isn't looking too promising. It will still be nice to get away and relax a bit. I "almost" bought a new car yesterday. My CRV was in for a recall issue and I had to use the restroom after 3 hours of waiting. It happened to be located in the new car showroom, of course! The man we have bought our last two cars from was there and recognized me. He showed me the brand new CRV and I was smitten. Hubby had already told me to buy one if I saw one I liked. He seriously did. I have the most amazing husband. I told the saleman I needed to talk to Dennis. After three calls last night to Dennis, he had lowered the price almost $8000.00! I am probably an idiot, but I called him today and said no thank you. Dennis said I could get it, but I just have a problem spending that much money when I love the car I have. Now I feel like I've saved lots and lots of money. I should reward myself somehow. Ha! Ha! And for those of you that know we teach Financial Peace classes, we do have the money saved for a replacement car when needed. No payments. But I think that makes it even harder to buy. Not much else is new since I last wrote. I'm going back to the doctor tomorrow because my arm where I was stung 4 weeks ago is still swollen and very sore. He wants to see it again. Bleh! I have packing to do for my trip. And I'm tired of doctors. No new pictures of sweet Piper but she got five injections as the doctor on Monday during her well child check. She's skinny and tall according to the national percentile. The little one eats more than a grown man does! Seriously! You should see her eat. Her Daddy is like that too though. And her other grandma is tall and thin. I used to be. Would you believe I weighed 95 lbs. and was 5'10" when we were married! True. Some things have changed in a BIG way and not for the better! 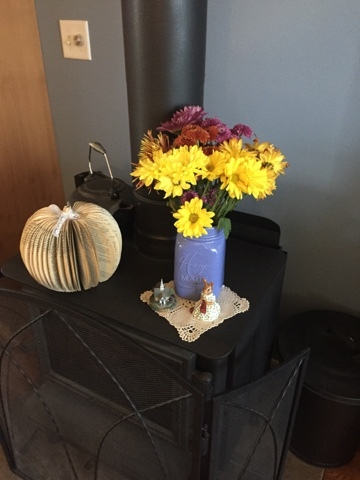 Okay friends, I hope it's gorgeous wherever you may be and you're enjoying the change of seasons. I'm going to do some dusting and a little cleaning before it's time to fix dinner. I didn't get my chores done earlier because it was our annual "meet with the insurance guy" day today to review our various insurance policies. Always fun. Not! Seems appropriate right now. Enough said. Hi there Betsy, saw this pop up on my dashboard so popped over, nice to keep up with your doings, so agree with you re sick of Drs I've a really yucky test next week, clear liquid only diet for two days before the test!! Week, I'm supposed to take meds with food each day. Only read notes last night so have to ring the rooms. Praying it will be all ok. I smiled re your new car, wise to wait if other is just fine. I pray weather is fine for your trip to the beach. Enjoy your dear ones. Betsy, I have a few more mittens if you want them. Let me know whhhe you plan to disputes them an ill mail them out to you asap! My friend I pray you have an awesome time on your trip. I'm off to Dallas Friday for my nephews wedding. I look forward to seeing and reading about your trip. Enjoy! Hi Betsy.. we're both looking forward to seeing you on Sunday! I just checked the weather forecast for Depoe Bay area and I am sad to report that you should probably not expect to see the sun. We had a lovely afternoon here but today it's been grey all day and a bit of sprinkles. But we still have fun here no matter what. 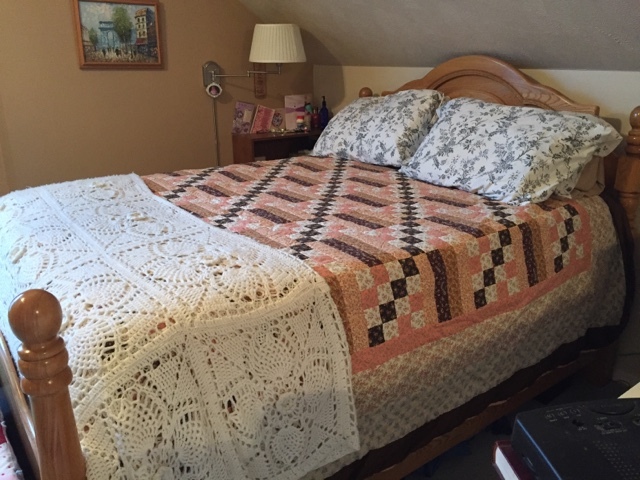 The crochet bedspread is gorgeous. Did you make it? My car is a 2004 and has less than 100,000 miles. It's a Toyota and should last another 10 years. I like to pay cash for a car, too, as I don't like paying interest. 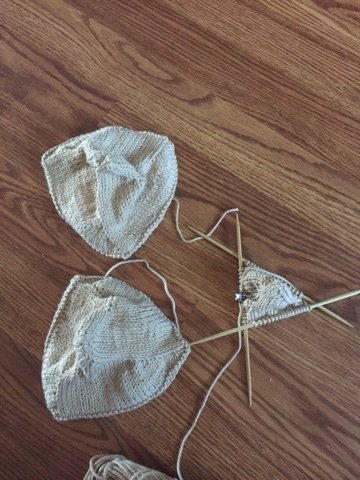 Love all your new knit projects. That quilt is divine. 80 plus tops? Wow. That was one productive quilter! The quilt is beautiful, what a wonderful gift. Hope all goes well with the visit to the Doctors and that you have a great trip to meet up with the girls. I wish I lived nearby so that I could join in the fun. You are certainly a busy lady with so many projects on the go and most for such wonderful causes. Take care. Your quilt is beautiful and your painting too....especially with those memories! Good for you about the car. I'm sure my Tahoe will be my last but I try to take good care of it so it will. Have a wonderful, safe trip and enjoy your trip and your friends! I love your blanket with borders too! Have a wonderful and safe trip Betsy. You will know when the time is right for a new car. i got one last year a Subaru outback and I already have 23,000 miles on it. I drive a ton for work. Like Nancy, my eye was drawn to the crocheted spread on your bed; it's beautiful. (So is the quilt.) Did you make the spread? Have a great time at the beach. I love it there, too! My car is a 2001 that I have about 100000 miles on. I bought it new. My theory is if a car is in good shape and not nickel and diming you in repairs keep it. The minute it starts getting expensive with repairs. Then its time to buy a new car. I put 300 dollars a month in my new car fund. I have enough in it that I could buy two new cars.... But I love my current "baby" to much to replace her. In my opinion you made a wise decision Betsy. Have a wonderful trip Betsy. Hope your doctor visit turned out ok. Love your crocheted top on the bed as well - and I also want to know if you made it. Oh my, a trip to Paris, that's a dream that I will probably never see come true, but I am always so happy when I hear someone say that they went. That painting will always bring back your sweet memories. I really like your cross stitch project, but I learned many years ago that cross stitch is just not my craft. I worked about 6 weeks on a small 5 inch square piece, LOL. 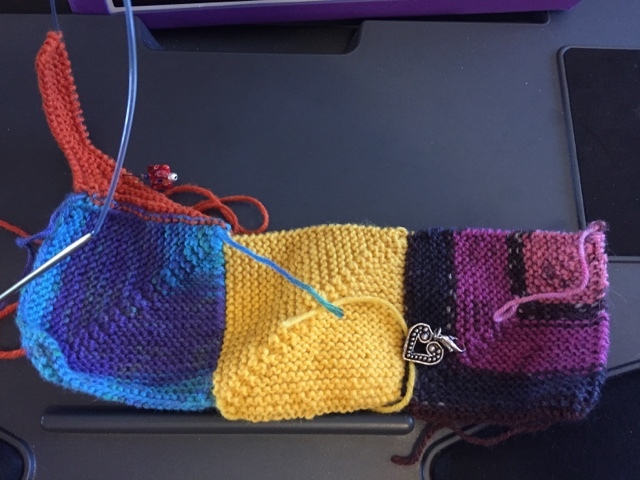 Love the blanket that you are making and the colors are wonderful. Thank you for stopping by and for your sweet comments and get well wishes. The doctor's report was very positive, I have a new prescription and I'm feeling quite optimistic. Thank you again, blogging sisters are so kind.